Welcome to Flawed yet Functional! I am a Type 1 Diabetic managing my diabetes through a Paleo diet and healthy lifestyle. I am insulin-free, gluten-free, grain-free, and dairy-free. While I believe a paleo diet is the optimal diet for good health, it comes with a price tag doesn’t it? It’s not a secret that fresh, healthy food costs more than processed, packaged food. So how do I make a Paleo diet affordable? I’m always curious how people live the life they live, so I’m here to share mine. My purpose is not for you to compare and feel better or worse about yourself, but just to give a point of reference. I know we all have limited funds to feed, clothe, and house ourselves, and we all put different emphasis on those aspects. In our house, we put a big emphasis on food, healthy food. The natural outcome of that is we spend good chunk of our monthly budget on food. To level set, I shop for two weeks at a time, and I am buying food for 4 people: 2 adults and 2 kids (2 and 4). Truth be told, my kids eat as much as adults so I buy/make a lot of food! My grocery budget is for food only. Toiletries, dog food, paper products, eating out, etc. come out of other parts of the budget. The grocery budget is for groceries only. We budget $260 for food for two weeks. I plan out my trips before I go so I know if I’m going to hit my budget or not. If I need a little extra money, I will likely borrow for our “Parties” or “Miscellaneous” category. I can usually do it for $260 though, give or take $10. I have no idea if this is high or low, and I don’t actually care to know. This is the amount that fits into our budget and puts fresh, healthy, life-giving food on the table. I’ve been brainstorming how to make a Paleo diet affordable, because it is, quite frankly, expensive. Here is what I came up with, but I’m sure there are more ways to stretch your dollar! If you have other ideas, please share in the comments below! You need a plan. You will overspend and impulse buy if you don’t have a list already made out before you go into the store. I just read in The Power of Habit that people tend to buy the same things when they grocery shop whether or not they need it and whether or not it is on their list. What? That’s crazy-town people! Make your list, and buy what is on your list! Be stronger than the urge to add to your cart “just in case.” You will have plenty to eat by only buying the things on your list. Let’s be real with each other: we all have food sitting in our pantry or frozen in the freezer that’s been there for a very long time. I menu plan precisely, and I have it too! To save money next time you shop, look at what you already have on hand. Make a plan to use it in a meal, or just get rid of it. Why let it keep cluttering up your precious space in your pantry or freezer? If you have a garden, learn how to eat all that your garden produces and preserve the overflow of what you can’t eat. Don’t let it rot! Search for recipes on Pinterest that use whatever your garden is producing currently or seek out good cookbooks for seasonal vegetables and fruits. The hunting item has been huge for us this year. Dan got a deer this fall, and I’ve always been a little leery of hunted meat. I don’t know why. I’m just used to my meat coming neatly packaged from the grocery store. If you have access to wild game, it can save you so much money! We replaced our beef with venison for almost 2 months this winter. Two months of not buying red meat! Huge savings! We ate it all ways: hamburgers, meatloaf, steaks, roast, casseroles, tacos, etc. If a recipe called for beef, I substituted venison, and we rarely noticed a flavor difference. One more tidbit, take advantage of other people’s gardens or hunting. If your neighbor has an abundance of zucchini, take it! You can do so much more than bake a quick bread with it. If your friend offers you wild game, accept it readily! Plop it into any well-seasoned soup, and I doubt you’ll notice a difference. Don’t feel like a mooch. You are preventing good food from going to waste. Take advantage of it! I’m not just talking about the grocery budget. If you want $260 free to spend on groceries without the electricity getting turned off, you need to budget all of your money. I highly recommend You Need a Budget. It’s a easy and relatively in-expensive tool to get all of your money in line. Learning discipline in all spending is a worthwhile endeavor, but if you focus on your food budget first, the rest will fall in line much easier. There’s something about budgeting for groceries that teaches important habits and discipline that will leak into your other areas of spending. Budget for it so you can enjoy it and not break the bank when you do. While this won’t actually save you money, you need a break from the kitchen. Make it a priority by setting aside a little money from each paycheck to make this possible. Research a restaurant before you go that will accommodate your dietary needs then sit back and enjoy not cooking! 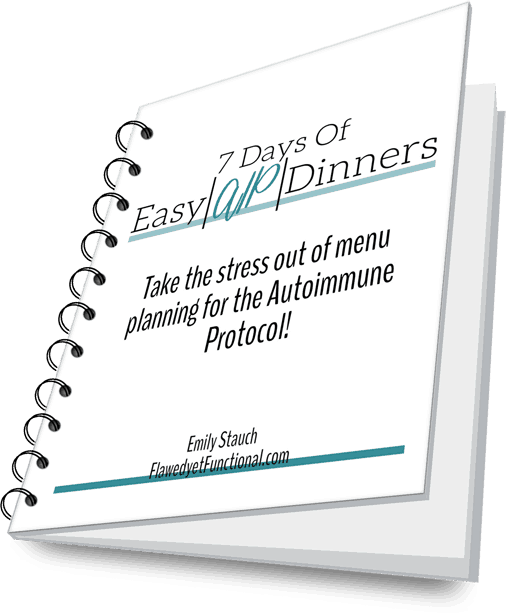 Even after you’ve made your menu plan, keep checking ahead a few days as you go through your week to make sure the meals will work with the scheduled activities for each day. For example, we decided to make a last minute trip up north to go skiing as a family. I needed a meal that could sit warming in the crock pot for hours in the lodge while we ski. I looked ahead, swapped a couple meals, and we were good to go on a day ski trip without spending money eating out and without sacrificing our dietary needs. Every so often, about once every couple months, I challenge myself to go an extra week before grocery shopping. You don’t have to go that long, but pick a certain amount of time and challenge yourself to clean out of the pantry, eat all the leftovers, and use things that have been sitting in the freezer for a long time. It will seem hard the first day or two, but you will quickly get into creating meals from odds and ends. I think you will be pleasantly surprised how easily you make it to your goal day. By now, you know I’m an advocate for eating at home. It’s healthier and cheaper than eating out. It’s also much easier to manage dietary restrictions in your own kitchen! What I want to touch on is “healthy” convenience packaging. I’ve talked about packaged salad mixes before, but my latest discovery is frozen cauliflower “rice.” Yes, you can buy it already chopped small, ready to be cooked. If you have to buy it for convenience sake, then do so, by all means. It’s better to eat it from frozen then not at all. Just know you are paying WAY more. My last cauliflower purchase from Aldi was $5.20 for 2 heads of cauliflower. I weighed my bowl after I chopped it in my blender: 4 pounds. This week, Meijer has frozen riced cauliflower on sale for $2.29 for 12 ounces. That would cost over $12 to get 4 pounds of cauliflower rice. I just have to mention that cauliflower was on sale my most recent shopping trip at Horrocks. I paid $.79 per head of cauliflower: $1.58 for roughly 4 pounds of cauliflower rice! If you can spare the time, cook from scratch. It’s vastly cheaper. Don’t get me started on salad dressing, cake mixes, and really any convenience food…. Spices can be expensive, especially less common ones (I finally found annatto seed! It took me about a month!). 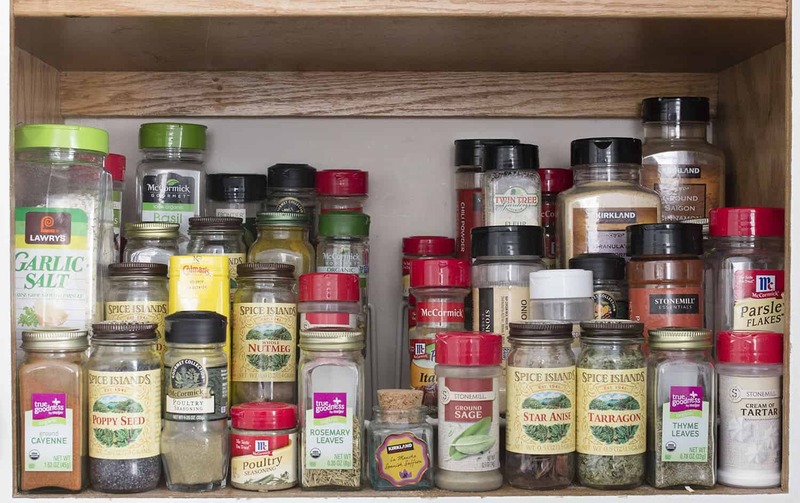 When planning your menu for the week, keep new spices to one dish or maybe two. If you are buying more than that each time you grocery shop, you are likely forking over more than $10 just on spices. I’m not saying it’s not worth it. It totally is! Just spread out buying them so they don’t break the budget. Another tip is buying seasonal spices at the end of the season. My last shopping trip, I was able to get nutmeg, cream of tartar, sage, and rosemary for $.79 each because they had Christmas labels on them. If you have wiggle room in your budget, pick up a couple when you see deals like this. My last tip on spices is organize them. You’ve got to know what you have so you don’t waste money buying a spice you already have one or two jars of. I did this early on in my marriage with cinnamon. I kept thinking I didn’t have any, so I’d pick up another as I walked down they aisle (the habit mentioned above!). At one point, I had four jars of cinnamon. Four! I like cinnamon, but that was a lot. It took us a while to consume that much! Like this post on green onions, learn how to properly store your more fragile produce so it will last your entire menu planning period. Do a quick Google search for whatever you bought. You will find several ideas for any type of produce. When in doubt, take the original wrapping off, rinse it, wrap in paper towel, then loosely set in plastic bag in the fridge. This works with everything from kale to lettuce to parsnips to cilantro. 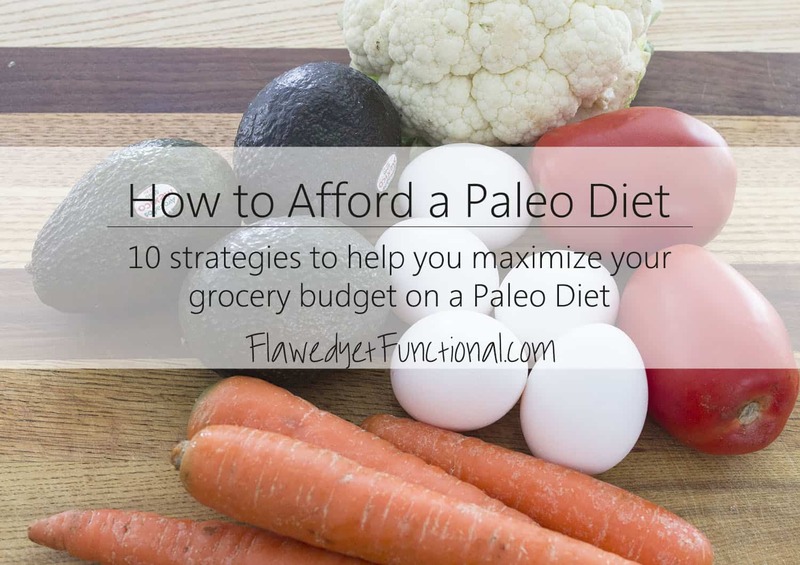 Those are my top 10 ways to make a Paleo diet affordable. It’s more about planning and learning skills in the kitchen then chasing coupons and sales. The more you practice planning, chopping, looking ahead, etc., the easier and more second nature it will become. Before you know it, eating Paleo will not take any more effort than how you are eating now and you will be able to do it within your budget. That’s my top 10! How do you maximize your grocery dollars? Shop less often? Shop at more stores? Shop at fewer stores?